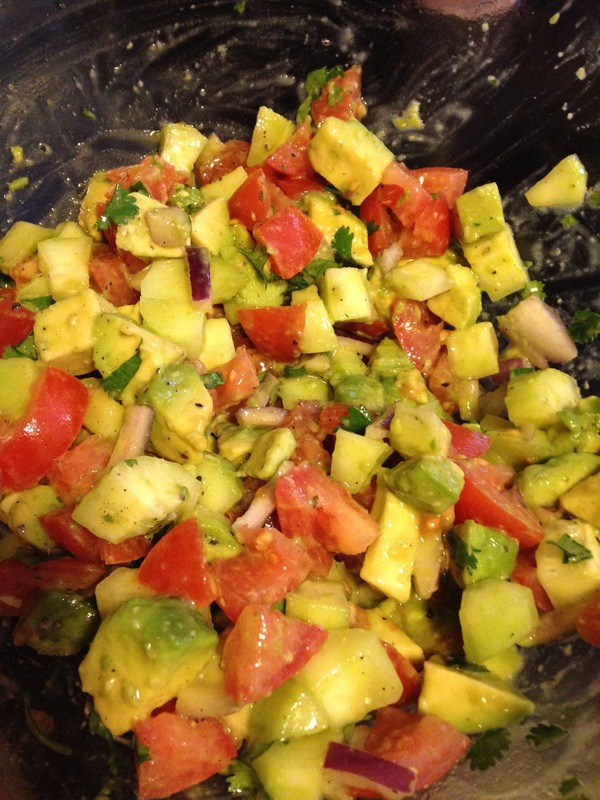 Chop your avacado, and tomatoes to about the same size. Slice your cucumber down the center long ways and scoop out the seeds with a spoon. Dice the cucumber a little smaller than the tomatoes and avacado. Mix all your veggies together, stir in the Oil and Lemon Juice, as well as cilantro. So, this idea came from my friend Todd… Full disclosure… But it sounded good, I tried it, and I loved it, so I have to share it 🙂 The best thing about this recipe was that it fed us for 3 full meals, and made great sandwiches on day 2! It’s super easy to boot! Todd’s version was a little fancier than mine, with sliced onion and fresh basil added, which I think would be a great addition. But, I’ll definitely be making this again. Editors Note: I used a store brand (Kroger) stir fry sauce for this recipe (see below). If you don’t live near a Kroger, you could use a similar sauce of a different brand. The sauce I used was 25 Calories per tablespoon. Trim fat from outside of roas and Salt and pepper the outside of your porkloin to taste. Place entire roast on a large piece of aluminum foil. Open up the roast where you cut, so you can season the center. In the middle of the roast, spread the garlic, and 1/4 cup of the Thai basil sauce. Salt and pepper to taste. Fold the roast back together. Some of the sauce is going to ooze out of the middle and onto the foil. Add about 2 tbsp more sauce to top of roast. Spread the sauce you added, along with all the sauce that oozed onto the foil, all over the pork loin. Place a 2nd piece of foil on top and fold the pieces of foil together at the edges, creating a sealed pouch around the roast. Continue folding in to Make the pouch tight against the roast. I used my gas grill. You could use a charcoal grill if you wanted but it’s important to use indirect heat and adjust the timing accordingly. Meat is done when it reaches 155 degrees in center. 1. Preheat your grill. I turned mine on high (all 3 burners) and left it for 5 minutes. 2. After preheating, turn the center burner off completely and turn the 2 side flames to medium-high. 3. Place the foil pouch on the middle of the grill so it is not directly above any heat source. Close your grill and let it go 20 minutes. 4. Flip and cook another 20 min. 5. After 40 minutes check the temp in the center of your meat. When it reaches 130 degrees remove from foil and turn the center burner on medium. 6. Continue cooking directly on the grill (out of the foil) until center reaches 150- turning meat periodically. 7. Remove to a platter and allow the pork to rest for 10 min. This is important! It allows the pork to stay juicy when you cut it and also continues cooking while it rests (it needs to get to 155 before serving). 8. Slice into 8 servings and serve each slice with an additional 1 tbsp of Thai basil sauce on top.